Everybody needs a go-to recipe for busy nights. 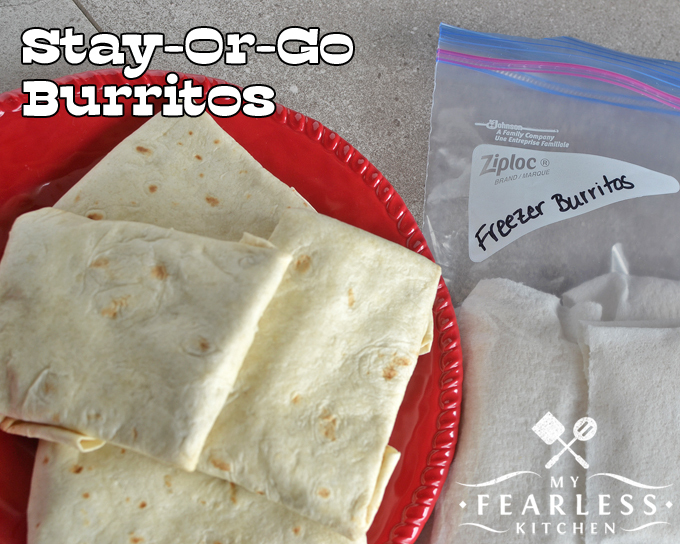 Enjoy these Stay-or-Go Burritos for a family dinner and keep some in the freezer to grab on the way out the door for a night on the run. 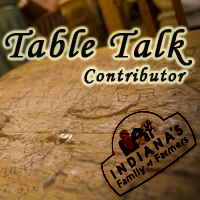 The fall tends to be a busy time for farmers. It’s harvest season! This means lots of long days, complete with very early mornings and very late nights. No matter when harvest starts, it always seems as if farmers are in a race against the weather to get the crops in and stored before it gets too cold or too wet. Lucky for me, Farmer Doc and I don’t raise crops. We raise cattle and a large garden, and run a veterinary practice. So traditional harvest time of year isn’t quite so busy for us. But, we do get hit in the spring and summer when it’s time to work the cattle (vaccines, deworming, artificially inseminating, checking for pregnancy, and later working the calves) and harvest and bale the hay all at the same time! Regardless of what type of crops or animals a farmer raises, there are always going to be a few months out of the year when the Farmwife (that’s me!) feels like a widow. We jokingly say that we are planting widows, or hay widows, or harvest widows. And while we would love to be able to see our men more, we know that this is a small price to pay to be able to live this lifestyle that we love! So what the heck does this have to do with burritos? Every Farmwife has a few “to go” meals under her belt, for just these times! We all have our specialty for when the guys need to grab something quick on their way out the door or we need to get something ready to take out to the fields where the hard work is being done. For me, it’s these burritos. (I originally found this recipe on my friend Cris’ blog – Goodeness Gracious. I’ve adapted it a bit since then.). You will need a very large skillet to make these burritos. I use either this this 5-quart saute pan from Calphalon or their 8.5-quart Dutch oven to make mine. You need plenty of room for all the ingredients, plus some extra room to stir it all together. It will take a little practice to get into your burrito wrapping rhythm. You need to figure out just the right amount of filling to put inside and how to wrap the burritos up tightly. But I know you can do it! 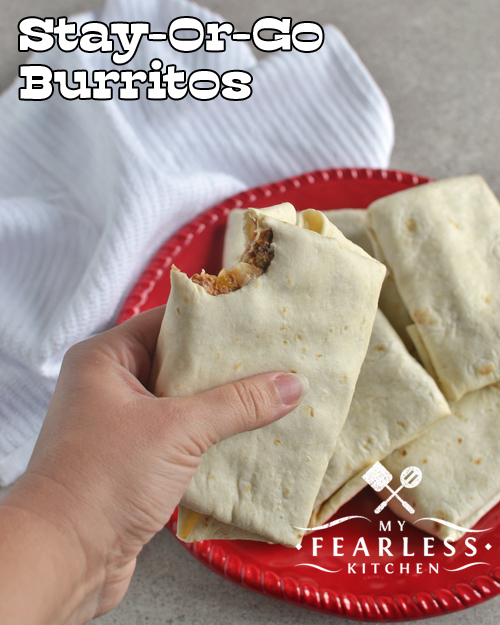 The best thing about these burritos is that you can add in whatever else you want. Need to add a few more vegetables in your family’s diet? Try more onion, garlic, or bell pepper in these burritos. Not crazy about beef but love pork? Use ground pork instead. Want a vegetarian option? Use black or pinto beans instead of meat. Go crazy, there are endless options! These burritos are great for on the go (one-handed eating, anyone?) or for a stay-at-home meal. Just add your favorite garnishes (a little more melted cheese, please!) and enjoy! To store these, I freeze them! Wrap each burrito in a paper towel (these are my favorite). Stash them in gallon-sized Ziploc freezer bags, and just pull out one or two when you need them! To reheat, leave the paper towel on and pop a burrito in the microwave for 60 seconds, flip it over, and microwave for another 30-60 seconds. That’s it! In a large skillet or Dutch oven, brown ground beef, onion, garlic, salt, and chili powder. Add Velveeta, stirring until melted. Add refried beans and salsa, stirring until combined. Simmer gently over low heat for 5-10 minutes. Remove from heat and let burrito filling cool for 10-15 minutes (it will thicken as it cools). Heat tortillas, one at a time, in a 12-inch skillet for 10-15 seconds on each side. Place a large spoonful of burrito filling in the center of each warm tortilla. Fold the bottom of the tortilla up over the filling, then fold the sides in, then fold the top down. To store, wrap each burrito in a paper towel. 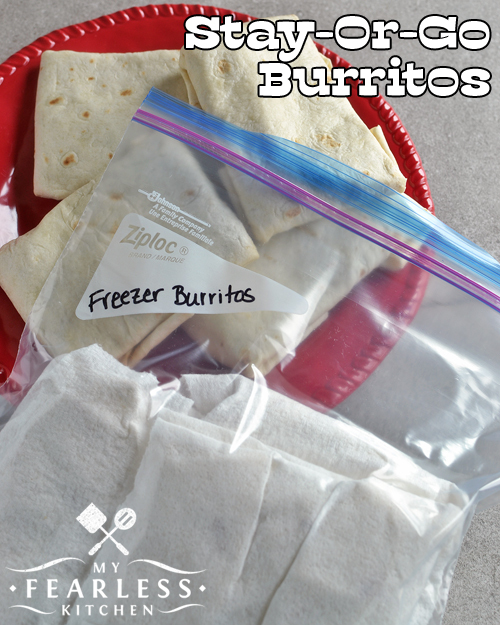 Freeze in a single layer in a gallon-size Ziploc freezer bag. To reheat, remove aluminum foil but leave paper towel in place. Microwave for 60 seconds, then flip the burrito over and microwave for 30-60 more seconds. « What Do Soybeans Look Like? Regular cheese doesn’t melt quite the same, and it tends to be a little oily. It depends on the recipe you want to modify. For THIS recipe, you could probably substitute “regular” shredded cheese without much of a problem. BUT you might not need as much. I haven’t tried it, so I’m not going to promise anything! But that’s the fun part about cooking – experimenting and having fun!